Dan Brown, "The Da Vinci Code," Hardcover, Doubleday. Review/order this book. Dan Brown, "The Da Vinci Code," Paperback, Anchor (2006). Review/order this book. Dan Brown, "The Da Vinci Code. Special illustrated version," Hardcover, Doubleday. Review/order this book. Akiva Goldsman, "The Da Vinci Code Illustrated Screenplay: Behind the scenes of the major motion picture," Broadway, 2006-MAY. Review/order this book. Jennifer Pauli & Christopher Culwell, "Fodor's guide to the Da Vinci Code: On the trail of the bestselling novel, " Fodors, (2006-MAR). Review/order this book. Peter Caine, "Walking the Da Vinci Code in Paris," Avalon Travel Publishing, (2006-MAR). Review/order this book. Betsy Eble, "Depth And Details: A Reader's Guide To Dan Brown's The Da Vinci Code:," Betse Eble, (2004). Review/order this book. Historical errors, criticism of organized Christianity, outrageous speculation, and the novel's phenomenal success have motivated at least a dozen authors to write books about The Da Vinci Code by Dan Brown. Most are highly critical. Also included in the list below is a book about the art and mythology of The Da Vinci Code, by David Morris. Richard Abanes, "The Truth Behind the Da Vinci Code: A challenging response to the bestselling novel," Harvest House Publishers, (2004). Nationally recognized researcher Richard Abanes, author of Harry Potter and the Bible, looks at three of the most fascinating people in history: Jesus Christ, Mary Magdalene, and Leonardo Da Vinci. Based on his extensive research, Abanes explores the answers to many of the questions that Dan Brown’s fictional thriller, The Da Vinci Code, raises. The Truth About the Da Vinci Code by bestselling author Richard Abanes is a user-friendly and easy-to-understood reference source for anyone wanting to make an informed decision about the claims made in Dan Brown's The Da Vinci Code. Unlike other books that may appear in response to Brown's riveting novel, Abanes' book will be concise (96-pages), inexpensive, and formated in such as way as to help Christians and non-Christians alike find the facts they need in order to form their own conclusions about the contents of Brown's volume. Each chapter of The Truth About the Da Vinci Code includes a short introductory section so readers can gain a greater understanding of the issues, then immediately provide a point/counter-point segment that details some of the most fascinating and controversial statements contained Dan Brown's book. Using this format will enable readers to find quick answers to some of their most pressing questions: Does Brown's novel accurately present history in general? Is it true that Jesus was married? Was Mary Magdalene supposed to take over the church as Christ's successor? What is the Holy Grail? Who were the Knights Templar? How did the secretive Priory of Sion come into existence? Can the Bible be trusted? What are the Lost Gospels? Was Christianity built upon "the greatest cover-up in human history"? Darrell Bock’s research uncovers the origins of these codes by focusing on the 325 years immediately following the birth of Christ, for the claims of The Da Vinci Code rise or fall on the basis of things emerging from this period. Breaking the Da Vinci Code distinguishes fictitious entertainment from historical elements of the Christian faith. For by seeing these differences, one can break the Da Vinci code. Ultimately, though, there is another code lurking behind the pages of this novel. Most readers of the novel have no idea that this other code is there. Breaking the Da Vinci code, though, will lead readers to discover why this novel has become something of a public phenomenon and why the issues it raises are worthy of careful study and reflection. How to satisfy the endless hunger for information among the millions of readers caught up in The Da Vinci Code mania? Secrets of the Code: The Unauthorized Guide to the Mysteries Behind The Da Vinci Code is the most comprehensive, literate guide available for interpreting the intellectual intricacies of Dan Brown's best selling novel. * What was the true identity of Mary Magdalene? Was Mary Magdalene a disciple of Jesus and did she write her own gospel? * Was Jesus married to Mary Magdalene? Did they have a child together? * In the late 1960s, the Church publicly reversed its 1,400-year-old position that Mary Magdalene was a prostitute, but this revised history was never effectively communicated to the public. Has there been a "cover-up" of the role of women in church history? * Did some geniuses of art and science--like Leonardo Da Vinci and Isaac Newton--belong to secret societies that had the most compelling "insider information" in history? Did Leonardo convey some of the ideas in The Last Supper and other paintings? Packed with excerpts from many original works, all-new material, and interviews with prominent scholars, Secrets of the Code will satisfy readers' curiosity, engage their imagination, and provide them with insights to better understand the multi-faceted mysteries, secret codes, and messages embedded in the novel. Meticulously researched and compulsively readable, this volume is an excellent choice for book clubs and discussion groups. Bart D. Ehrman, "Truth and Fiction in the Da Vinci Code: A historian reveals what we really know about Jesus, Mary Magdalene, and Constantine," Oxford University Press, (2004). James Garlow, "Cracking Da Vinci's Code: You've read the fiction, now read the facts," Cook Communications, (2004). This fascinating contribution to the Da Vinci Code controversy, ably narrated with only occasional excesses, is one of many rebuttals to the assault on conservative Christianity that Dan Brown's novel represents. Like arguments on both sides of the issue, the writing is full of pejorative hyperbole and logical lapses. But it contributes to the discussion by laying out some important differences in the way Christ is regarded by traditional Christians as compared to the Gnostic Christians, whose gospels were suppressed after Christ's death. With only some moralizing, the program tries to answer the question of whether understanding Jesus in Gnostic terms is part of a neo-pagan, quasi-religious movement or a healthy broadening of our relationship with God. Brandon Gilvin, "Solving the Da Vinci Code Mystery," Chalice Press (2004). Few mystery novels have stirred as much interest and sparked as much discussion as Dan Brown's The Da Vinci Code (Doubleday, 2003). Christians and non-Christians alike are drawn in by secret societies and intrigued by the notion of Mary Magdalene as Jesus' wife and the scandal of a massive cover-up by the church. But The Da Vinci Code is fiction, right? Drawing on the Bible, non-canonical texts, and a wealth of historical thought and contemporary scholarship, Solving the Da Vinci Code Mystery helps readers to separate fact from fiction. It provides a context for understanding what we really know about the history of Christianity and the church. Rather than just discrediting and debunking the theories posed in the The Da Vinci Code, Solving the Da Vinci Code Mystery uses Dan Brown's postulates to explore the importance of many of the issues raised, including the loss of a sense of the sacred feminine in mainline Christianity, the importance of non-canonical gospels in early Christian communities, and the issues at play in the debates at Nicea and other early ecumenical councils. People are talking. The Da Vinci Code has been on the New York Times best-seller list for almost a year and is raising a variety of responses from Christians and non-Christians alike. Some are outraged and upset by the claims of Dan Brown, while others are left utterly confused and don't know what to believe. The Da Vinci Code: Fact or Fiction? explodes the myths of the book and shows the reliability of Scripture, the divinity of Christ, as well as the historical facts for the Priory of Zion and the Knights Templar. This is the only hands-on accessible reference guide. The Da Vinci Code: Fact or Fiction? helps you turn debate about the book into an evangelistic opportunity. Hank Hanegraaff is a leading Evangelical theologian. Da Vinci Code is a modern-day publishing phenomenon. With millions of copies in print, it is the most popular adult novel of the 21st Century. In an introductory note, author Dan Brown tells us that "all descriptions of documents and secret rituals . . . are accurate." But are they? Many scholars and theologians have attacked the book and the "facts" on which it is based. Some claim that Brown is anti-Catholic. Book clubs, reading groups, dedicated web-sites and countless reviews and articles in magazines and newspapers worldwide have fueled the fire, making Da Vinci Code not only the most successful book of its kind ever, but also the most controversial. Now Martin Lunn, an expert historian, reveals the truth behind Dan Brown's research. The reality of Catholic offshoot Opus Dei . . . the hard facts about the bloodline of Christ and King David . . . the origins of the Knights Templar and the infamous Priory of Sion . . . the secrets of Temple Church and Rosslyn Cathedral . . . the real Saunière . . . the mysteries of Rennes-le-Château and much more. Da Vinci Code Decoded also provides an exhaustive tour of the locations visited by the novel's characters: The Louvre Museum, l'Eglise de Saint-Sulpice and Rue Haxo in Paris; Château Villette; Temple Church; Westminster Abbey; Newton's tomb; Chapter House; St. Faith's Chapel; Rosslyn Chapel and many others. This book received very low ratings by Amazon.com customers. David Morris, "The Art and Mythology of the Da Vinci Code," Lamar Publishing (2004). A beautifully illustrated coffee table art book that weaves its way through the art and mythology of The Da Vinci Code, this book is an art guide to unlocking The Da Vinci Code. Beautiful illustrations and insightful narratives guide the reader through the art and mythology and make us feel we are privy to the keys that unlock the secrets of The Da Vinci Code. If you are like most readers, you mentally visualize the people, scenery, architecture, and objects described in whatever text you are perusing. The idea for this companion book to Dan Brown's Da Vinci Code was conceived by readers who, like you, do just that. Although they had created their own imaginary images to supplement their reading of this best selling novel, they wanted to actually see the images described and used to develop the plot. The Art and Mythology of the Da Vinci Code, by David Morris, provides the opportunity to do exactly that. It offers photographs of all the major buildings, landmarks, art and mythology referenced in Dan Brown's best selling novel. The images are presented in the order that the theological references, theories, and clues are provided to solve the mystery. Whether you are reading the novel because it's a great mystery or because you are intrigued by the theological hypotheses, this volume will exponentially enrich the experience. If you have already read the novel, this volume will allow you to revisit the art and mythology and perhaps expand your knowledge of them. Carl E. Olson & Sandra Miesel, "The Da Vinci Hoax: Exposing the errors in the Da Vinci Code," Ignatius Press, (2004). The Da Vinci Code, Dan Brown’s best selling novel, purports to be more than fiction: it claims to be based on fact and scholarly research. Brown wants his readers to believe that he is revealing the long-concealed truth about Jesus, Mary Magdalene, and early Christianity, a truth that he says has been suppressed by the malevolent and conspiratorial forces of the Catholic Church. The novel alleges that there has been throughout history a secret group of true followers of a Gnostic Jesus and his wife, Mary Magdalene, the true "Holy Grail". Almost everything most Christians and non-Christians think they know about Jesus, according to Dan Brown, is completely wrong, the result of Catholic propaganda designed to hide the truth from the world. Read reviews or order this book. TFP Committee on American Issues, "Rejecting The Da Vinci Code: How a Blasphemous Novel Brutally Attacks Our Lord and the Catholic Church," The American Society for the Defense of Tradition, Family and Property, (2005-OCT). "See why Fr. John Trigilio called this book 'a brilliant succinct, objective and convincing refutation of the prolific errors found in Dan Brown’s Da Vinci Code'." "With a forward by EWTN host Father Andrew Apostoli, Rejecting The Da Vinci Code will be a formidable tool for those who want to oppose the cultural offensive against Christianity and Christ." 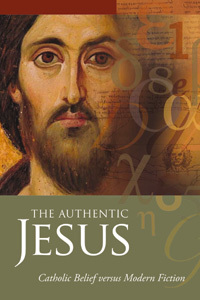 United States Conference of Catholic Bishops: "The Authentic Jesus: Catholic belief versus modern fiction," USCCB Publishing (2006). "Recent popular portrayals of Jesus Christ often raise more questions than they answer. Sometimes they directly challenge what the Church teaches and even the motivation behind these teachings. This new booklet from the USCCB presents authentic Catholic teaching about Jesus and his divinity, the Bible, Gnostic gospels, women and the Church and other important topics in a convenient question-and-answer format." Order this 16 page booklet. 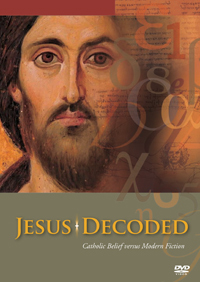 United States Conference of Catholic Bishops: "Jesus Decoded: Catholic belief versus modern fiction," USCCB Publishing (2006); a 60 minute DVD. Dan Brown's international bestseller The Da Vinci Code has raised many questions in the minds of readers. - Was Jesus really married to Mary Magdalene? - Did he father a child with her? - Did Constantine suppress the earliest Gospels and invent the doctrine of Christ's divinity? - Do the Gnostic Gospels represent the true Christian faith which the early church sought to supplant? The Da Vinci Code, in blurring the lines between fact and fiction, popularizes the speculations and contentions of numerous more serious books that are also attracting wide attention. How should we respond to claims that we now have documents that reveal secrets about Jesus, secrets long suppressed by the church and other religious institutions? Do these new documents successfully debunk traditional views about Jesus and early Christianity? Ben Witherington confronts these claims with the sure-footedness of a New Testament scholar, yet in the plain language that any interested reader can follow. He takes us back to the early centuries after Jesus' death and tells us what we can really know about Jesus, Mary Magdalene, the canonical Gospels and their Gnostic rivals.